The snareSTRIP prevents snare head damage due to punctures from broken snare wires. The snareSTRIP prevents snare head damage due to punctures from broken snare wires. Durable, and made from a proprietary woven material, snareSTRIPs are placed under the ends of the snare wires and protect and reinforce the bottom snare head where it is most vulnerable. STRIPS can also be used to repair snare heads from previous small punctures. When used as a tone modifier, snareSTRIPS can help focus the snare response by slightly drying out the head and reducing overtones. 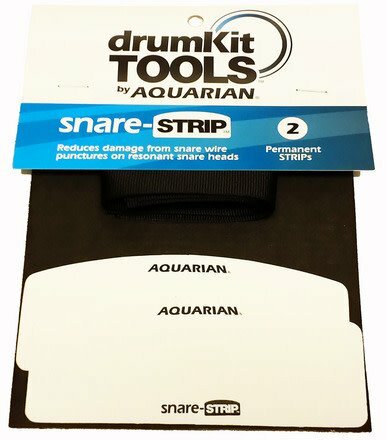 Two snareSTRIPS come in each pack, Included with each snareSTRIP pack are two polyester "sure grip" replacement snareSTRAPs for secure snare tension.